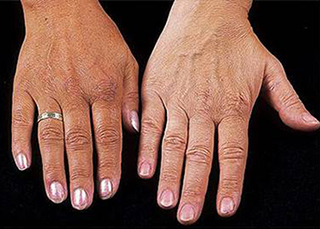 Hemochromatosis is a metabolic disorder which results in the accumulation of excess iron in the body's organs. This too much iron load on the body causes damage such as liver disease, heart problems and diabetes. The liver is the organ most affected by hemochromatosis, because of its relatively large blood flow. There are two types of hemochromatosis- primary and secondary. It is caused by inherited genetic defects. The HFE gene helps to regulate the amount of iron absorbed from food. C282Y and H63D are two known mutations of the HFE gene. The most common cause of primary hemochromatosis is C282Y defects. It usually occurs due to the result of another disease or condition that causes iron overload such as getting a lot of blood transfusions in people with severe anemia. Fatigue, weakness, lethargy, apathy, weight loss, feeling tired, abdominal pain and joint aches. Your family member has this disorder. You are having symptoms listed above. 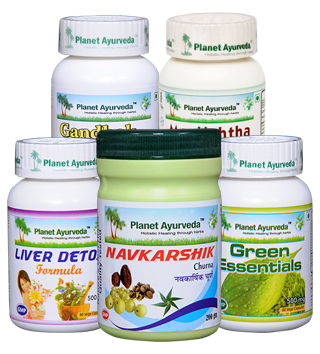 Ayurveda is the best and ancient method that helps to treat any disorder in a natural way. Imbalance of vata, pitta and kapha doshas mainly leads to health problems. 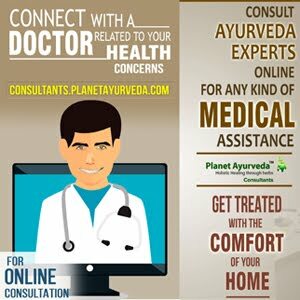 Planet Ayurveda provides amazing ayurvedic treatments. High iron absorption from the body's organ is prevented using following herbal remedies. The goal is to reduce your iron levels return to normal. Manjistha (Rubia cordifolia) is most popular blood purifier that has been used to treat Hemochromatosis. Manjistha helps to balance aggravated pitta and breaks up congested kapha. Manjistha play an important role in balancing pitta if there are many pitta-aggravated imbalances in the body, especially those of the blood. Dosage: 1 capsule twice daily with plain water after the meals. It is a mineral based excellent ayurvedic medicine. Detoxified sulfur is its main ingredient which is used in preparation of Gandhak Rasayan. It has great antibacterial, antiviral and antimicrobial properties. Gandhak Rasayan works effectively in all health conditions due to its broad-spectrum antibiotic activity. In ayurveda, Gandhak Rasayan is a drug of choice and well known for this condition. Dosage: 2 tablets twice daily with plain water after the meals. It is a very effective supplement for the patient who are suffering from Hemochromatosis. Green essential capsules are capable to fight against health ailment and leads to healthy and happy life. These are rich in vitamins and minerals. Grape seed, wheat grass, spirulina, green tea and amla are the main ingredients that are used to prepare such an effective herbal remedy. Grapes are rich in vitamin C and play an amazing role in boosting immune system. Wheatgrass is a very effective ingredient used to treat too much iron problem. Spirulina has anti-inflammatory property. Green tea and amla have strong antioxidant which enhances immunity power. This capsule has a unique combination of herbs which acts on the liver in very effective and natural way. It is useful in detoxification of the liver and keeps it healthy. Kutki, Punarnava, Kalmegh, Makoy, Kaasni, Biranjasipha, Himsra and Haritaki are the major ingredients used to prepare this capsule. It is effective herbal remedy to eliminate too much iron load from the body. It has anti-inflammatory, antibacterial and anti-infective property. This churna is a blend of very powerful herbs: Amla, Haritaki, Bahera, Vacha, Neem, Manjistha, Katuki, Giloy and Daruhaldi. Dosage: Boil 1 teaspoon of powder in 400ml of water until it remains 50-60ml. Use regular tea strainer too filters this preparation. Take is twice daily after 45 minutes of meals and you can prepare it fresh every time for its best effects. All above mentioned herbal supplements for hemochromatosis are 100% pure herbs and are free from chemicals, preservatives and colors. These supplements work wonderfully to make equilibrium of all three doshas- vata, pitta and kapha.